By William Boos in Uncategorized on April 6, 2019 . In a country whose name has become synonymous with generations of war, the past year has been marked by multiple climate catastrophes. First, drought brought a massive food crisis to over 10 million people, stunting the growth of about 40% of children under 6 years of age, and forcing hundreds of thousands of people out of their homes. Then too much water arrived in early 2019, with heavy snow blocking passage between regions and intense rainfall destroying homes and killing at least 63 people. Afghanistan lies only a bit northwest of India, but unlike that monsoonal nation it receives most of its water in winter. In summer, the heavy rainfall over India and Bangladesh excites a continental-scale atmospheric wave that causes dry air to descend over Afghanistan and much of Pakistan. Afghanistan’s water arrives when the strong midlatitude jet stream hits the western edge of the Tibetan Plateau in winter, causing water to condense and precipitate as it rises over the mountainous terrain. But in late 2017, only a bit of precipitation fell when the wet season should have started, and by the end of that winter less than half of the normal water had been received. The following summer was even drier than usual, and the dryness continued through the end of 2018. 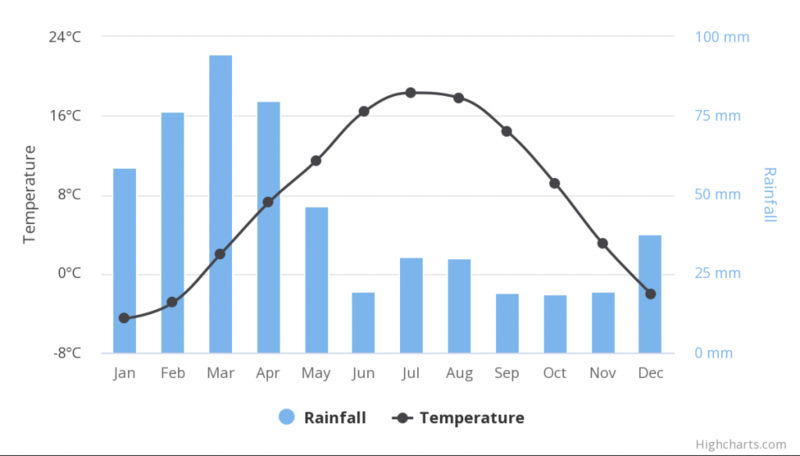 Average rainfall (blue bars) and temperature (gray line) for Kabul, Afghanistan. From the World Bank’s Climate Change Knowledge Portal. Afghanistan is a nation of farmers, with about 80% of its population making its living through agriculture, so drought can be particularly devastating. Not only is locally grown food destroyed by hydrological extremes, but the economic activity that would allow people to purchase imported food is also compromised. In the 2017-2018 drought, over 90% of farmers reported having insufficient or even no seed to sow in the planting season. The United Nations Food & Agriculture Organization classified 11 million people as being severely food insecure, with 2 million children under the age of five being acutely malnourished. 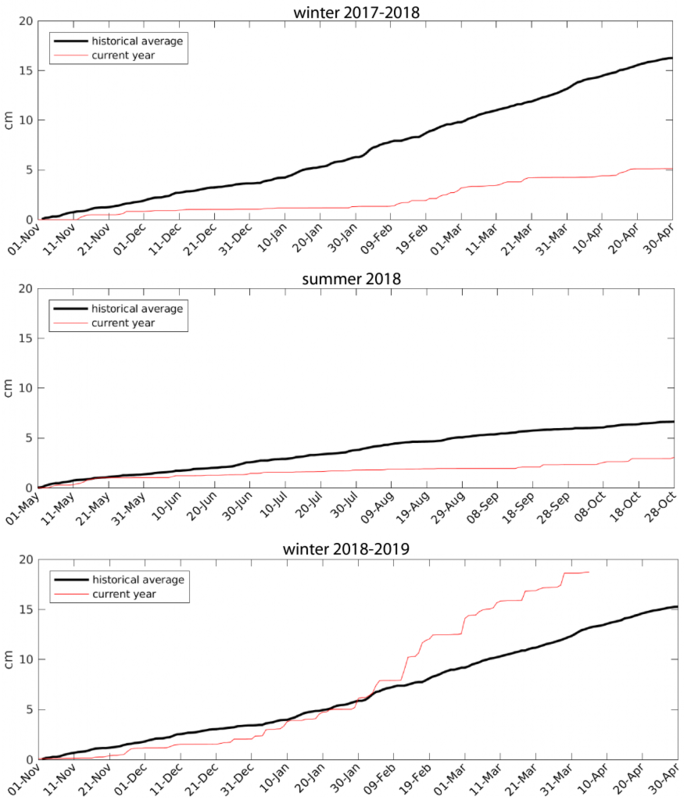 Normal (black) and actual (red) precipitation accumulation for the past two winters and the intervening dry season, averaged over a rectangular box covering most of Afghanistan. Data is from NOAA’s Climate Prediction Center global rain gauge network. After more than a year of severe drought, the snow and rain began to fall in early 2019. It took until early February for the region to catch up to its normal amount of water accumulation, but then the water continued to come. Now, in early April 2019, almost 50% more precipitation has fallen than the long-term historical average for this time of year. After the worst drought in decades, torrential rains killed planted seeds and flash floods swept away people driving in cars; over 12,000 homes were damaged or destroyed by floods. Why the drought and subsequent floods? El Niño (and its sister La Niña) may be to blame. The waters of the eastern equatorial Pacific cooled in autumn of 2017 as a La Niña episode emerged and persisted through spring of 2018, spanning Afghanistan’s rainy season. Southwest Asia tends to be dry during La Niña winters, seemingly due to changes in the jet stream in that region; it also tends to be wet during El Niño winters (when the eastern equatorial Pacific is warm instead of cold). With an El Niño event emerging in fall 2018, the too-wet rainy season we are seeing now fits the pattern well. Indeed, a wet rainy season for Afghanistan was projected in the seasonal forecast that was issued in November of 2018 by the IRI at the Lamont-Doherty Earth Observatory (see figure below). Typical effect of El Niño and La Niña on global precipitation during the northern hemisphere’s winter. Red regions get more rainfall during an El Niño event and blue regions get less, with that pattern reversed during La Niño. The quantity plotted is the correlation coefficient (multiplied by 100) between precipitation in each region and the Nino-3.4 index, as calculated and plotted by NOAA’s Climate Prediction Center. The fairly successful forecast of precipitation for the winter of 2018-2019 over Afghanistan, issued in November 2018. Most of Afghanistan was predicted to have an above-normal chance of above-normal precipitation. El Niño seems remarkably relevant for the global pattern of flood and drought that has occurred this winter. Australia, southern Africa, and northern South America are dry (see orange regions in below plot), as is typical for an El Niño year (see blue regions two plots prior, which show where rainfall is negatively correlated with the Niño-3.4 index). 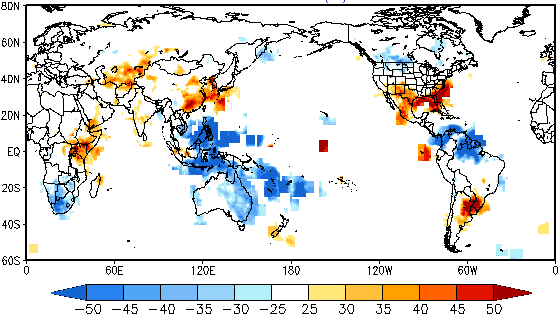 Eastern China, southwestern Asia, the southeastern U.S., and southeastern South America are wet (blue regions in below plot), which also match the typical El Niño impacts. Of course, the current wet and dry regions don’t match the historical impact patterns exactly, but once you knew El Niño had arrived this past fall, you would have done pretty well if you just used the historical anomaly maps to predict rough regions on the planet that would be abnormally wet or dry. How will Afghanistan fare in coming months? The IRI forecast includes continued wet weather this spring and early summer, part of a broader pattern of wetness across southwestern Asia. This brings hope for the future, with projections of the wheat harvest being optimistic and rangeland conditions for livestock expected to improve. The Famine Early Warning System Network reports that agricultural labor opportunities have improved some since the drought. But the benefits of this spring’s abundant water supply seem to still lie mostly in the realm of future potential rather than current reality: agricultural labor opportunities, though improved, remain below-average, and non-agricultural labor opportunities also remain below-average. Wages are unchanged and livestock prices are low. Any improvements, furthermore, must contend with the background of armed conflict in the region. The latest IRI forecast for precipitation. Note the enhanced likelihood of a wet spring-summer over southwestern Asia. ← How successful were this summer’s monsoon forecasts?